Aperto was a separate section of the main, international exhibitions of the Biennale, designed to explore more experimental, emerging art. 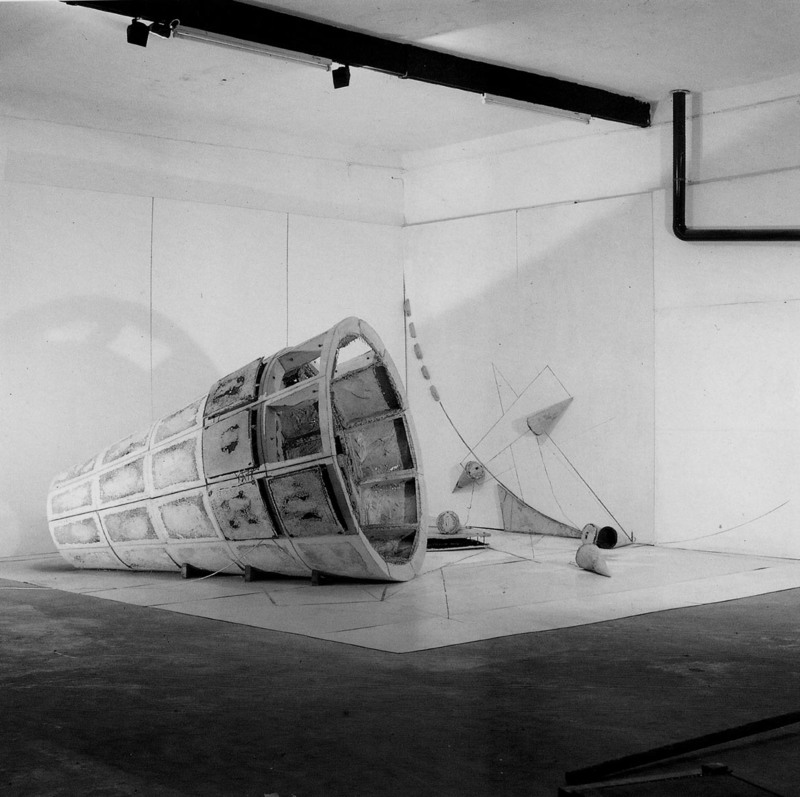 In 1989, the Biennale Director, Giovanni Carandente, accepted an invitation by the Ministry to come to Cyprus for studio visits; he particularly liked the work of Theodoulos, and recommended him to the Aperto committee of curators and critics, who finally decided to invite him to the exhibition. The selection was certainly based on high international standards, and Theodoulos was the first Cypriot ever to appear in the main events of the Biennale. The artist was given a 7x7m space in the Arsenale, next to artists like Jeff Koons and Damien Hirst. His work, entitled Autofoto-Heterofoto (greek terms for ‘self-illuminated’ and ‘illuminated by another source’) was a geometric rendition of Aristotelian principles, particularly those dealing with the philosophy of form and the logic of ‘mind over matter’. His cone-shaped sculptural installations, scattered on the floor or hanging from the surrounding panels, created a sort of futuristic moonscape where ‘planetary’ units projected or reflected light. The show dealt with recurring themes in Theodoulos’ work, like the passage from darkness to light and from the inside to the outside, combining media technologies with existential symbolisms and universal notions of natural philosophy. Despite the weak financial and organizational support, Theodoulos’ work was mentioned in La Stampa, Corriere della Sera and La Repubblica, among others, and following Aperto he moved on to a series of collaborations with important contemporary art centres and galleries in France, Germany, Switzerland and Greece. In 1997 he appeared in Venice again, this time inside the Cyprus pavilion, next to three other artists. 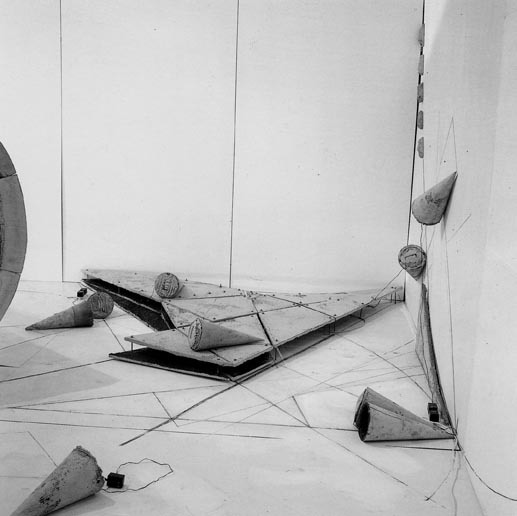 Theodoulos Gregoriou, Installation View, Autofoto-Heterofoto, 1990.